The pursuit of excellence is a personal choice. Examples of excellence can be found in small, medium, and large organizations spanning private, public, and nonprofit sectors. Wherever excellence exists, it is the legacy of men and women who have made their personal choice to be excellent and taken effective action. 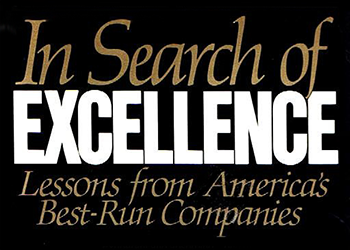 Tom Peters Company helps people on their journey toward excellence. Our experience serving clients in this way goes back to the late 1980s and the legendary Skunk Camps, when Richard King and Madeleine McGrath began working with Tom. They are now at the center of a global network of experienced and passionate TPC consultants, coaches, trainers, and speakers, all of whom are well versed in Tom Peters’ work and are experts in one or more aspects of excellence implementation. Our Excellence Model and Audit Tools help people to work out for themselves where they are on their excellence journey and highlight the best route forward, for individuals, teams, departments, or whole businesses. Our products and services get people moving in the right direction and help them to accelerate their progress toward excellence. See the excellence challenges our clients come to us with.